Last modified on October 19th, 2018 by Joe. This Android tutorial is a a continuation of our ListView series. 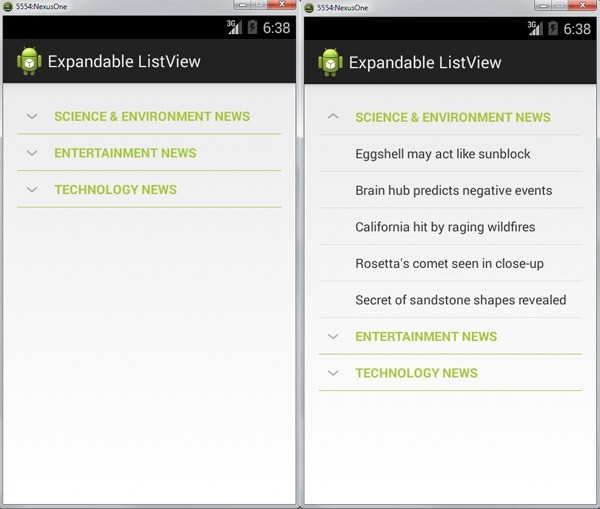 We will builld an example Android application to explain how to use the expandable ListView. ExpandableListView is an Android container available as part of the platform. It will be useful to display grouped set of items. On click of the group titles the child elements will be expanded. As seen in the “Android ListView Custom Layout Tutorial” we can use a type of array adapter to control the data displayed in the expandable list view. We will use the BaseExpandableListAdapter to supply and control the data displayed in this tutorial. Following example app is to display a list group with three categories. Each category will have five child items grouped under a title. On click on a title it will be expanded and its child item will be listed and on next click it will be collapsed. We instantiated ExpandableListView and attach the adapter to it. This is a BaseExpandableListAdapter which supplies and manages the underlying data for the ExpandableListView. Comments on "Android Expandable ListView"
Thank You Sir. How can i use intent to open new page when i click on child of a expandable list view ? Hi – great tutorial, I’ve hacked it successfully for my app. Question: I have a lot of parent groups (about 200), each with up to 12 children. When I click on a parent, it opens up to show the children, but instantly scrolls the next parent to the top of the visible area on the screen (and you have to thumb down to show the expanded children). Have you encountered this, and can it be fixed? Comments are closed for "Android Expandable ListView".